It was mid-January. The upland bird season for Missouri was closing. In Kansas the season continued until the end of January. It really didn't matter, as the bird population in Missouri was dismal to say the least. Anyway it was for us and virtually every bird hunter we spoke to, had the same experiences. Kansas was better, but not up to par. Droughts or floods were the cause. This past upland season was a complete disaster for yours truly regardless of the bird population. My troubles began on the Kansas upland opening weekend. Our group consisted of three HSP members. We reserved property in the east central part of the state. My 18 month old English Pointer "Amy" injured her back sometime during the day. There was no indication from her that there was a problem until we quit for the day. She made it to the truck, made a circle or two in the grass, laid down, and would not move. She would not drink, eat or accept pampering. The following morning she was worse. I called my Vet and he agreed to meet me that Sunday afternoon. OUCH! It took the remainder of November and almost all of December before she was given a clean bill of health. So it was an obvious choice to hunt Kansas. I did a lot of searching in the harvest reports to find a property within a 2 hour drive that had potential. Yes it was mid-January. It was also 55 degrees, 30 M.P.H. south winds with gusts up to 40! Thank goodness the wind did not present itself until later in the day. Within the first 30 minutes a single quail busts out. Two shots followed, no bird. We expected the remainder of the covey to be close by. Nope! We criss-crossed the area and turned up nothing. 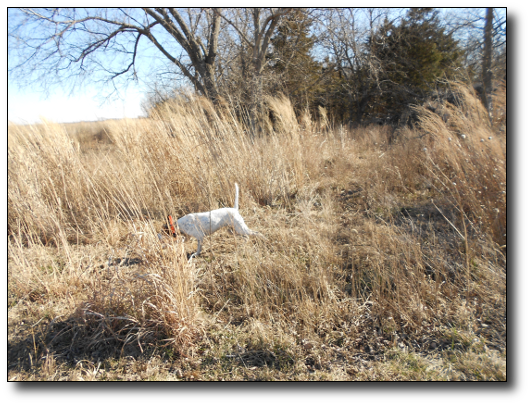 60 yards ahead, and another single quail busts from the dense, thick underbrush, and makes it to safety. It is now obvious that the covey has been busted by someone or something. We changed tactics by staying closer together. This makes it more difficult to walk over a bird. We ended up taking only two birds. The wind began to howl and the dogs found it difficult to "lock on" the birds scent. On the trip home, we began comparing mental notes. Solid points were few and far between. "Flash points," and "birdy" dogs were more comon. We had all agreed that the wind was the problem, and yet earlier in the day, when the wind was quite calm, the dogs experienced the same problems. The smart one in the group pulled out his I PAD and went to work. Within minutes he had the asnwer. HUMIDITY. The humidity that day was 22%. Breeders, Dog trainers, and field trial specialists agree that the prime humidity range for dogs is between 66% and 88%! Now we could all understand what was going on, under our noses. Add that high wind to the humidity factor and by golly we did pretty darn good! 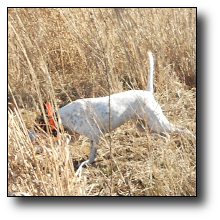 I have been an avid upland game bird hunter for "numerous" years, and owned my share of hunting dogs. Now, I can say with sheer honesty, and know beyond any doubt that this is 100% correct: "I have never called a hunting buddy to ask him to lookup the humidity to see if we should go or not!"